Get your Metal Rocks Radio Merchandise right here. 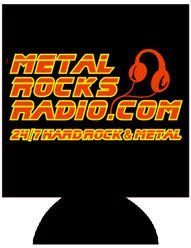 Metal Rocks Radio is a non-profit hard rock and metal internet radio station. We are offering this merchandise at the lowest possible cost to you. Any money made from the sale of this merchandise will go towards covering the cost of keeping Metal Rocks Radio on the air. Thanks for all of your support. Please Allow two weeks for shipment of your order. Copyright Metal Rocks Radio 2010. Awesome Inc. theme. Powered by Blogger.